These panels each consist of a black lacquered panel with applied pewter floral and foliate designs, a pewter border with finely carved and applied relief bone decoration of Chrysanthemum flowers and foliage to the centre. 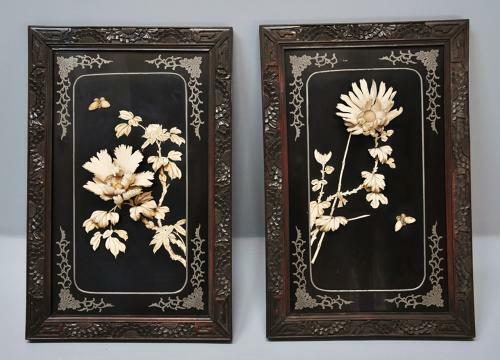 Both panels retain their original hardwood frames with carved Chrysanthemum decoration. In Japan the Chrysanthemum flower is called 'kiku' and is a symbol of the Country itself and often represents longevity and rejuvenation. Both panels are in very good original condition, are both of stable construction and can go straight into a home.